Economist Arthur Grimes suggested earlier this week building 150,000 new homes to reduce Auckland house prices by 40%. This idea was described as ‘just crazy’ by the Prime Minister. Is it? We know that in Auckland the median house price is more than 9 times the median household income. The standard international definition of ‘affordable’ is 3 times, so it is pretty safe to say that Auckland’s house prices are a long way from being affordable. The maths of restoring affordability are fairly simple; we need to reduce house prices relative to incomes. To achieve that we either need to reduce house prices, increase incomes, or both; slow the growth in house prices so that it is less than the growth in incomes. In contrast, the Government’s target is to return house price growth to ‘single digits’. That is no guarantee of house prices becoming more affordable. Instead, if the Government achieves their target it could just as likely mean that already unaffordable housing gets slowly more unaffordable. As an aside, returning house price growth to single digits seems inevitable – the current rate of growth cannot be sustained indefinitely – at some price level people would stop buying. From an affordability perspective Grimes’ plan seems comparatively sane. The concern the Prime Minister raised was that people would lose their equity and banks would be put in trouble. As Grimes pointed out, housing is an investment like any other so why can’t prices come down? Most investments are by their nature a risky business. Values may rise or fall; just ask any Kiwi who piled into the sharemarket back in 1987. The law of investments is the more return you get, the greater the risk is that you could lose it all. Why shouldn’t that apply to housing? Indeed, we have seen price falls in some parts of the country in recent years. As for the risk to banks, in Grimes’ view (and he is a former Reserve Bank chair) our banks could handle that kind of shock; in fact they could handle up to a 55% drop in Auckland house prices. The Prime Minister shouldn’t fret about this one, it is the job of the Reserve Bank to ensure that banks are prepared to deal with a fall in house prices. The Morgan Foundation has for many years pointed out that the lending rules around mortgages have helped fuel the speculation in the housing market. The Reserve Bank has argued that housing is a lower area of investment, which justifies higher leverage without increased risk to the economy. However this has become a self fulfilling prophecy – allowing for higher leverage simply means that investors pile in until housing does eventually become a risk. The Reserve Bank seems to be realising this increased risk, they have already implemented loan to value ratios (which look set to be tightened further) and perhaps the use of debt to income ratios in the future. So the risk to banks is low and assuming the Reserve Bank continues to act, looks set to remain that way. Finally the Prime Minister argued that developers could be hit by any drop in house prices, which would work against Grimes’ plan for 150,000 new homes. However, Grimes’ suggestion wasn’t for business as usual. His was a bold plan to build up and out. Allowing increased density in the inner suburbs would provide a strong incentive to stop land banking and start building, otherwise developers could see their land values start to fall. Similarly on the fringes Grimes was suggesting using the Public Works Act to acquire land, and using the profits from that to fund the development of infrastructure. While a fall in house prices could hurt certain developers who own a lot of land and were slow off the mark to develop it, it is hard to see how it would hurt development. Are there enough builders to build the houses in Grimes’ plan? We found the builders to build in Christchurch – we got them in from overseas where necessary. The Christchurch rebuild will be winding down soon, so there will be plenty of spare capacity if the jobs are there. Is Grimes’ plan really that radical? The most extreme part of his proposal is compulsory land acquisition; effectively forcing owners to sell their land. However, the Government is already looking at this idea as a way to reduce land banking, so it is hardly radical. As we have pointed out, closing the loopholes around the taxation of assets would be a far less invasive incentive against land banking. The only really radical part of the plan is the sheer scale, particularly for intensive development in the city. This is the part of the plan that scares politicians because it means standing up to residents that oppose development in their back yard. The problem is that these NIMBYs vote, and have a much louder voice than the future tenants of those inner city apartments. However, intensification is essential for restoring affordability. As we have discussed previously, sprawl may deliver cheaper housing, but once the private and public costs of transport are taken into account it often ends up more expensive overall. Intensification is the thorn that must be grasped for sake of the future of Auckland. Geoff Simmons is an economist working at the Morgan Foundation. This article is here with permission. With interest rates where they are and Govt Bonds yielding 2.254% where else can you put your savings to earn an income? The NZ Stock Market is yielding around 4.5% so some relative value there. Alternative is to stash money under the bed and hope for Armageddon. There has been so much money printed around the world in the last 9 years the only way to maintain relative wealth has been in physical assets. NZ has become victim of its own success(relative to rest of world- I know many will disagree!) and now has a safe haven premium attached to it. well said, it strikes me that some so called economists cannot grasp these simple facts / numbers and what is happening around them ... maybe just stuck in their books and never been in business. Nonsense. If NZ were a safe haven, it would not have a currency that has been pounded against a currency such as the yen. The fact that NZ is reliant on the outside world, particularly for cheap credit, should explain to most people why NZ is not a "safe haven." Not sure I agree. If you look at the TWI-5 index it clearly shows the NZD has been strengthening! Most Govt debt is internationally owned. China owns >12% of US debt. Believe it or not NZ is part of an international market place. Righto, if NZ were such a "safe haven", can you explain why NZD and AUD were absolutely trashed against JPY and USD during the GFC? Why do you think that was? Is it because money was flowing into NZ? Are you saying that NZ is relatively more attractive now than in 07-08? Fundamentally, nothing has changed and looking at a 5-day TWI tells me very little. Think about it. i don't agree. nz currency is too strong at present. this is one of the issues the rbnz is struggling to tackle. using the yen as your argument. really? And in terms of being reliant on the outside world for cheap credit - firstly we are less reliant than we were 10 years ago. And secondly have you ever heard of leverage? finally going back to Japan - the Japanese government is virtually bankrupt. The Japanese economy has been in freewill for decades, experienced deflation, and have massive public debt. Nz by comparison has virtually none. You probably are unaware that the USD has depreciated 20% against JPY in P12M. Yes, I'm using the yen as an example because Japan is effectively a creditor nation and has been a source currency for the carry trade. The fiscal position of the Japanese govt is irrelevant. If NZ were a "safe haven" JPY would be falling against NZD. That is far from reality. You are talking nonsense based on little understanding of capital flows. Armageddon and money is worthless, its just paper and you cannot eat, drink or breathe it. It will be blowing down the streets but it will not keep you alive. Yeah let's totally destroy confidence in the NZ housing market and introduce communism and build slums. Clever sillies in the Universities. .. the current rate of growth cannot be sustained indefinitely – at some price level people would stop buying. It seems the solution to the problem is right there. I can't understand why they keep pushing this drop house prices by +40% thing. It's going to get people's backs up. Surely they should suggest building more houses as a means of providing more options for FHBs. So .... relaxing restrictions on urban density is now "communism". One must come to the interest.co.nz comments section to experience the truly Orwellian. Sorry pal, letting markets work is not communism. Letting private citizens do what they want on the property they own is not communism. Far from it. I might be wrong but I thought Zachary was alluding to compulsory acquisition powers rather than intensification per se. If that's right, I agree with him. The bulk of what Simmons and grimes propose is to let the market work. To label all of it as communism is totally misleading. I agree with you on that specific proposal. Although it might be more accurately labelled as fascist, rather than communist. It's a non starter for a variety of reasons. Increased density is far more realistic. It was the compulsory thing plus the sheer scale that would require some weird government intervention that I disagree with. Also stating that the banks would be fine with it but hardly mentioning the huge equity losses for hundreds of thousands of home owners who would lose billions. I mean really we don't care about a bank, it is just a company. Also even today's FHBs still want some sort of hope of a capital gain. Deliberately crashing the market would have grave unforeseen consequences. Deliberately crashing a market because you fear the market crashing seems dumb. The thing is I don't believe it is a bubble for reasons I have explained many times. Problem is no one ever sees the asset bubble until it is has burst. Then it becomes "obvious". The fundamental problem is that house prices have become so disconnected from income i.e. unaffordable. As our glorious leader has said before "it doesn't meet the sniff test" - no matter how you chop and dice it or try and rationalize it. 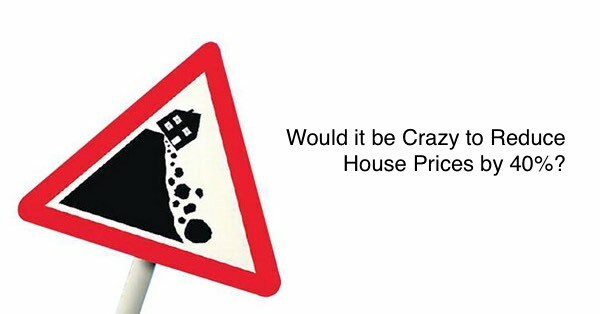 As to whether we should deliberately crash the housing market - in some respects investors are doing that all by themselves by pushing up prices to the point were they are investing based on expect price rise / capital gain rather then yield or ROI i.e. they are speculating - is that any different to the Dotcom bubble where company's were burning through cash with no real prospect of making money. It's called the bigger fool theory. Are you worried about some form of "communism" creeping into your utopia or the threat to your housing portfolio. Of course I am concerned about my portfolio taking a hammering especially if it is unnecessary. We will rally our forces and fight back against any socialistic attack against our wealth. Communists always target the Landlords and landowners. It's their hallmark and it is always a disaster. It's not a bubble as a house in Auckland is a globally recognised #Goodbuy! Who's "we" - the landlords and landowners - sorry you're outnumbered by the lowly peasant with their sharpened pitchforks. You use an emotive word like communist against anything that may threaten your point of view - someone else could tar you with the fascist brush or as an enemy of the people. To me you seem to think your point of view is the only correct view - this seems like locked in thinking. I think you will find the Landlords and land owners are the more powerful and influential group. Let's see what happens at election time. All those single home owners across the country who have seen some capital gain recently - not going to want to lose it, oh no, no way. Oh it's all about power and influence - the delusion of control. You are right ZS. The more the population are inclined towards owning property then the more powerful they become. Property owners are voters. Unfortunately. More renters than there used to be moa. Not noticed that ? It's one vote per PERSON Zach, not one vote per property owned. I agree with ZS on this one. Property owners have families too PocketAces who all vote. Talking of deliberately crashing a market is insane. There are other ways of rebalancing the market over time, that will achieve exactly the same outcome. This without creating the collateral damage. To be fair Zachary I'm not sure the the social imbalances are healthy in the medium term. Tax reliefs have to go on second homes and also 5% stamp duties should be introduced. Well, that would be fairer and less dangerous than crashing the market for everyone. You have developed some wide ranging perspectives last few months Zach. But today you really seem to have developed an alarmed tunnel vision suddenly at the 40% dip. A bit overgeared perhaps ? I would be better off than most and certainly better off than most recent FHBers. Why does fighting back have to be alarmed? I signaled that I was going on the offensive. Instead of using this lame technique of saying someone is frightened because they disagree why don't you come up with some rational and persuasive arguments? Just a wee word in your shell like, your "fighting" back reads much more like flailing, and the real fighting back is coming from the more and more people who are struggling, they've had enough of the status quo, you might have to accept it is their time now. Nope, I'm enjoying it. Attention all home owners. Don't vote for anyone who wants to rob you of your equity This is a call to arms (metaphorically). For more and more people, it is already crashed!!!!!!!!! Another Crazy comment on a crazy suggestion to promote crazy plans to get NZ back to 2007 recession ! ... The Morgan Foundation and Mr Simmons seem to follow the view that communism is better for the country and trying to mass a long cue of egalitarian cheerleaders behind them .... so how many FHBs are there anyway , not 300,000 surely !! What a ....?? .... crazy and irresponsible thoughts, I say!! Ok, but the current 'investment' frenzy, fueled by a 'Free Market' Ideology and Crony Capitalism, is better? I would say that there is the potential for everyone to suffer, just trying to get this under control, let alone if it continues, then pops. Yes, if we're going to throw around labels, "crony capitalism" is the best I've seen so far. Property bubbles worldwide seem to have been based on cosy cartels based around political-finance-monetarism-development components, with each one playing its role. In the case of NZ, our cartel matches that of Australia's in many ways, which makes sense considering the cultural and aspirational similarities. People who consider this a "supply / demand" issue should probably take note that the Japanese bubble collapsed and radically changed the corrupt construction / land banking problems that the country faced. Japan is now extremely productive with construction of residential housing (remember, they also produce their own building materials). Also, since the collapse of the Irish property bubble, the Irish export sectors of the economy of outperformed noticeably, particularly with dairy. The country has become a hotbed of innovation. When people are forced into a position to survive, perhaps that's when they're at their best. Ireland was one of the worst examples of crony capitalism during the pre-GFC bubbles. Try hard and you can't...Too much hot money floating around the world, with Central Banks pumping in more and more (a la Brexit), this heat is not going to cool down soon. I agree. It's going to end naturally soon anyway. Imagine if we tried to artificially crash the housing market and an international shock happened at the same time. Then it really would be Armageddon. Be careful what you wish for. For decade, the well-meaning have been trying to make the poor live in smaller places. For decades the poor have resisted. It seems that the well-meaning do not learn from history. Man never learns from anything - as a species we seem doomed to repeat the mistakes of our forefathers - only we seem to be doing it on a bigger scale and with more devastating consequences. It is called greed. Never ending. A possible solution could be to build housing for FHBs that is subsidized to a degree with conditions about use and length of time required before it can be sold. This would ensure a home for many as well as the prospect of capital gain. This is something a political party could suggest that would win votes from both sides of the argument. Hmmm..how about a house with zero prospect of capital gain but it is yours and is affordable? Will there be any takers? A bit like those retirement apartments. They already exist in Japan in their public housing system. They even existed during their bubble. Most of the first home owners approach their homes that way only, affordable place to live in, not worrying about the possibility of future increase in value. Those values have become skewed since houses became commodities to buy and sell and make a profit out of. How can one deny the crisis and for how long. Need more journalist to come out with facts and not theory. This may be a question for HardworkerDoes or any other struggling FHBer. If the government set up a program of house construction where each house cost 350-400k, were fairly modest but nice, healthy with a fenced yard and offerred them with up to 100% government finance but with a catch -you could not sell them on the open market or rent them out. If you wanted to sell them you would have to sell them back to the government perhaps at the same price or general inflation adjusted as long as the house was in similar condition as when bought. This would provide healthy homes where people could hang pictures, decorate, own a dog, raise children and be safe from eviction due to circumstances other than not paying the mortgage. Would people be attracted to this or prefer the law of the jungle/status quo? It is probably where things will have to go, minus the judgmental aspect of it regarding the way people choose to live their lives e.g choosing not to marry. It will, of course, have a few consequences for you, a much, much smaller pool of disenfranchised people for you to draw on to feather your own nest. Bring it on. At the moment all we do have is the law of the jungle where housing goes, you seem to be pretty happy about that. You will have to have some rules to stop the place descending into depravity and chaos. My tenants are not disenfranchised and tend to earn good money, have nice cars and go on overseas holidays regularly. I wouldn't get involved in slum landlording because I couldn't tolerate that type of tenant. I went to a complex of units yesterday to help my wife's colleague assemble a new bunk bed. The place was terrible, with piles of rubbish, overgrown common areas, cabbage trees growing out of the roof gutters and everything looking decrepit. No body corp - theses types of places need a body corp! One of the units was for sale for about 500k. Now all these places could be nice if people just got their act together. Nice and healthy too. This is why I want Auckland to be expensive, to modify people's behaviour, raise them up or if that fails exclude/replace them (robots? ), to build Elysium. "Depravity and chaos"???. Boy, oh boy you demonstrate an odd view of things, people who own something, who have a stake in the ground tend not to be chaotic. Don't you get it? It is people who HAVE been disaffected and disenfranchised who have come to a point of hopelessness that we see in society now? It is NOT the other way around!! And on the depravity bit, I can guarantee you there will be plenty of it going on in your wealthy, exclusive society in the way of drug use, licentiousness, fraud etc than you can shake a stick at. Maybe but at least they keep up appearances. Although that's not actually true, you have been watching too much Hollywood. I just picked up three bags of rubbish from the street on my morning exercise. I think that qualifies me to comment. What have you done for the community? Not a bad idea. Hope the government seriously thinks on these lines. I am sure there will be many takers from the FHB category for this. And if the government is serious about spending more money on infrastructure like roads, power, etc these houses could be built in outlying suburbs with easy transport access to the city centre (though that CBD concept itself is an outdated concept in city dwelling). Labour seems to be on the right track along these lines with their promise to build such affordable houses.. There is no silver bullet. Nevertheless, supply is one of many concepts that Auckland needs to grasp urgently. The Auckland Council is doing their part to address the issue, however its very disappointing and upsetting that our Councillors chose to delay the plan, making the situation worse and wasting more time and resources. Thanks a lot!